Respect. Protect. Detect. Do you know? 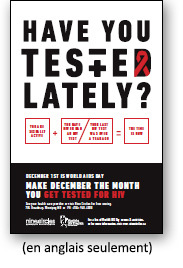 HIV testing (by name or coded number) and other STI testing is available at ALL physician clinics, community clinics and hospitals in Manitoba. All services are confidential and free. Health Links – Info Santé at 204-788-8200 in Winnipeg; in Manitoba toll-free 1-888-315-9257. When it comes to sexually transmitted infections (STIs)– including HIV – knowing if you are infected or not is an important step to protecting yourself and others.